I love birthdays and I love dreaming up birthday cakes. I was very pleased with how this one turned out. The base is made with 2 square chocolate cakes. 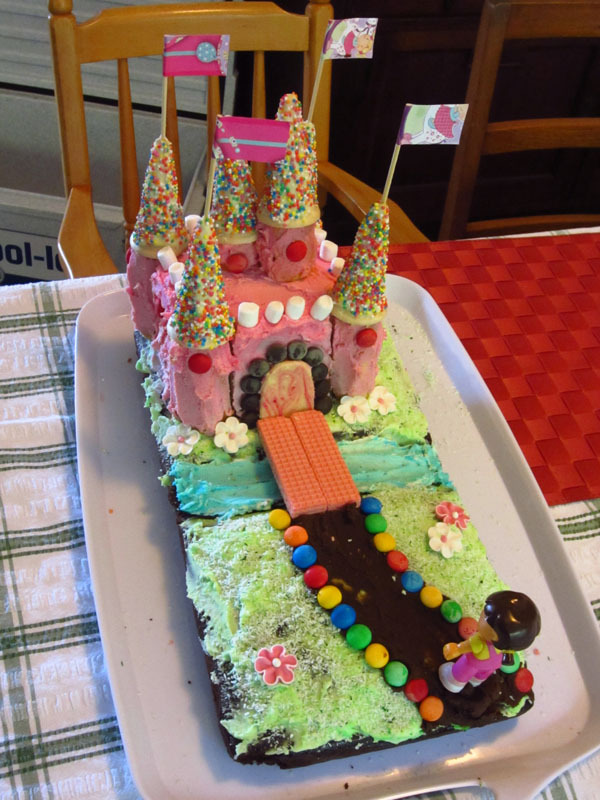 I trimmed the side of the cake where the two cakes join to make them sit more neatly together, and then put one of the trimmed pieces as the bottom of the moat. 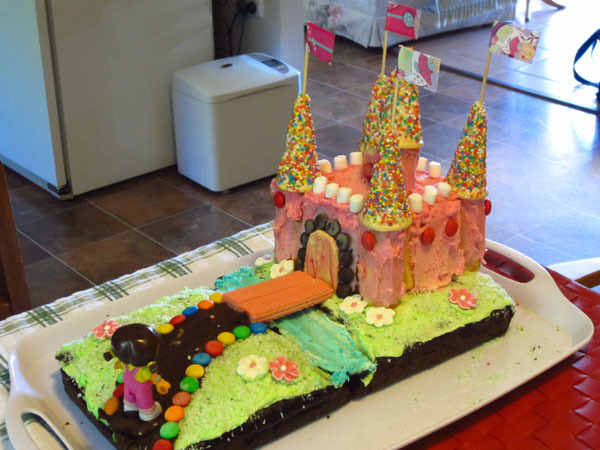 The castle is made with 1 rectangular cake cake cut into two matching squares. The squares went on top of each other. The trimmed off pieces were used to add to each side of the castle, so I ended up with a cube shape with missing corners where the towers needed to fit. The towers were made of small sponge rolls, and the two towers on the top were made from one sponge roll cut into two different length pieces. I dipped small ice cream cones in white chocolate and dusted them with sprinkles for the spires. (I used chocolate to stop the the cones from getting soggy, however they weren't very tasty so runny icing would have also done the trick). The flags were made by gluing some rectangles of pink wrapping paper to cooking skewers. The skewers were then pushed right through the cones and sponge rolls and cake to keep everything in place. The left over white chocolate was spread on baking paper and I swirled a bit of pink food colouring through to get a marbled effect. I cut out a door shape from the chocolate when it set. The bridge was made from pink wafer biscuits. The whole cake was iced in a thin layer of butter icing, and decorated with tiny marshmallows, sugar flowers and M&Ms. The grass was sprinkled with coconut that had green food colouring rubbed through. The birthday girl loved it (and so did Mr 4)!